It seems like Royal Caribbean designed Harmony of the Seas to have everything in spades, including bars and lounges. A ship as large as Harmony of the Seas offers guests many choices in where to enjoy their favorite beer or cocktail. There are lots of great spots all over the ship to try, but we wanted to share a list of our favorites. When considering our favorite bars and lounges on Harmony of the Seas, we placed importance on the bar decor, special offerings and general ambiance that resonated well after the drinks ended. We present our list of the top 5 Harmony of the Seas bars and lounges for your reading amusement. A staple of any Royal Caribbean ship is the Schooner Bar. Over the years, the Schooner Bar has become a popular spot for guests to enjoy drinks, listen to music and convene for various events. On Harmony of the Seas, this tradition continues along with an Oasis class touch. What we like about the Schooner Bar on Harmony of the Seas is the various activities that occur each day and night, including trivia and piano music. Additionally, part of the Schooner Bar overlooks the Royal Promenade, which is great for people watching. The Trellis Bar is located in the Central Park neighborhood and what makes this bar a great spot for a drink is the ambiance of its surroundings. Central Park is a lush, open air part of the ship where guests will likely spend time exploring and enjoying the natural beauty of the flora found throughout the area. The Trellis Bar is situated near the middle of Central Park, which means you will be surrounded by the park while enjoying a drink. Royal Caribbean updated the look of the Trellis Bar a bit on Harmony of the Seas, relative to her sister ships, and the new look adds to the atmosphere of the drink experience. The best part of enjoying a drink at the Trellis Bar is in the evenings, when Central Park becomes even more beautiful with the exquisite lighting that activates after dark. In addition, guests can hear live music being played in Central Park, which makes the Trellis Bar our favorite spot for drinks any evening of the cruise. Live music and drinks seem to go together so well, and the Boot & Bonnet Pub in the Royal Promenade is a great choice for enjoying music you can sing along to, while sipping your favorite drink. The Pub is always a good spot for meeting with friends for drinks, and Royal Caribbean did a great job making the Pub look like an authentic English bar experience. Most evenings, there is a guitarist present who will play popular bar songs, and after a couple of drinks, you are likely to join in the singing fun. Speaking of live music, Boleros is one of the best places on Harmony of the Seas to enjoy great live music, especially if you want to get up and dance. Boleros sports a Latin-themed motif, with bright colors, lots of seating and a stage where bands play terrific salsa, merengue and more. Boleros on Harmony of the Seas is rather large, which means ample seating around the lounge, near the bar or in the many comfortable chairs. There is something about Latin music that just appeals to everyone. Maybe it is the smooth melodies or the intoxicating will to dance, but Boleros is always full and always a good spot for an evening drink while you enjoy the band play. Regardless of if you actually get a drink here, the Bionic Bar is an experience to itself onboard Harmony of the Seas. Two robot bartenders can make two drinks per minute, delivered in plastic cups via four conveyor belts. This is an undeniably cool experience and something that is just as fun to watch happen as it is to enjoy a drink. Built by Makr Shakr, the idea is simple: guests place orders via tablets and then can watch the robot bartenders start mixing the cocktails. Bionic Bar combines two big trends, robotics and mixology. Guests walk up to tablets, where they can place orders for drinks, choosing from classic cocktails, signature drinks like Mnemonic Madness (a rum, pineapple juice and Midori concoction) or test the robot bartenders’ skills with their own creations. Certainly the nearby Rising Tide Bar is quite intriguing too, but the Bionic Bar regularly has a crowd that convene to enjoy the spectacle of the robot bartenders doing their thing. From the top deck, overlooking Central Park, through a series of twists and turns and finally onto the pool deck, The Perfect Storm trio of water slides offers the best – and most exciting – view on Harmony of the Seas. Thrill seekers can launch themselves through a swirling champagne bowl funnel slide or race down several decks on two lightning fast dueling slides. It’s just one more way to enjoy a beautiful day at sea! Two of Royal Caribbean's newest cruise ship that offers cruises from the United States, and have garnered a tremendous amount of interest from guests, is Harmony of the Seas and Anthem of the Seas. Today, we compare both cruise ships in a head-to-head comparison. In comparing both ships, we break down each ship's offerings and summarize what the strengths and weaknesses of both ships to see how each ship stacks up. As objective as we may try to be, the reality is we are talking about opinions, and as such, personal preferences will vary from person to person. We will certainly try to convey why we liked or disliked something, but understand some may disagree (and that is okay). This should be a fun contrast. Both ships offer a variety of productions for guests to enjoy, comprising original productions and Broadway shows. Let us be very clear: the shows on both ships are wonderful, so we are about do the cruise ship equivalent of argue about which cut of steak tastes better. The Broadway show on Anthem of the Seas is, "We Will Rock You", which is a West End musical that uses the music of rock band Queen in the performance to tell its story. On Harmony of the Seas, guests can enjoy, "Grease", the Broadway musical all about summer love in the 1950s. Both shows are identical to the original productions and we will call it a tie between the two of them. Both ships also offer a slew of original productions to enjoy. Anthem of the Seas offers shows such as "The Gift" and "Spectra's Cabaret", which are a mix of music, dance and special effects. They represent the latest in Las Vegas-style entertainment and are anything but ordinary. Harmony of the Seas has Royal Caribbean's first original musical, "Columbus: The Musical", as well as two different ice skating shows. In fact, 1887 might be the best ice skating show we have seen on any Royal Caribbean ship to date. The real X-factor for both ships are their specialized entertainment venues. Anthem of the Seas puts its best shows in Two70, a massive theater on the aft of the ship that can be transformed digitally in a number of ways. In fact, the Vistarama and Roboshows in Two70 are absolutely stunning to watch. Harmony of the Seas follows up with two shows in the AquaTheater, both of which are centered around eye-popping stunts and acrobatics. While Harmony of the Seas has a greater array of entertainment offerings, we feel the quality of Anthem of the Seas' shows gives it the edge. Two70 alone is filled with a great variety of entertainment that has to be seen to be appreciated. When we talk about onboard activities, there is a lot of options across each ship. Simply put, you will not run out of things to do onboard. Guests on Anthem of the Seas will have their choice of a number of Royal Caribbean innovations that make the Quantum class ships quite different from other ships in the fleet. North Star, the observational pod that takes guests 300 feet above see level for a 360-degree view of the ocean and area around them is very popular and equally impressive. Ripcord by iFly allows all anyone who's mother forbid them from ever contemplating sky diving to give it a shot in a much safer environment. Then you have the SeaPlex, an immense area of the ship dedicated to being active at sea. 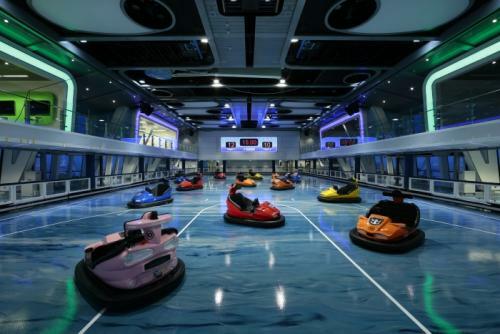 In fact, it is the largest indoor active space at sea, where guests can play on a full-size basketball court, go roller skating and even ride bumper cars. Harmony of the Seas answers back with a ton of firsts of its own. Harmony of the Seas features the three water slides that are sure to get everyone in the family asking to ride it one more time. Speaking of slides, the Ultimate Abyss is the kind of slide experience that words cannot do justice. It is large, intense and a lot of fun while descending the 10 stories down. Harmony of the Seas has double the amount of FlowRiders that Anthem of the Seas has and a brand new aqua park for kids, Splashaway Bay. If you prefer your activities a bit more sedate, Harmony of the Seas also has a very fun escape room experience, rides and games in the Boardwalk and more. One advantage Oasis class ships have always enjoyed is that they offer much more than any other ship, and in this case, the staggering amount of activities on Harmony of the Seas gives it the win for things to do. Perhaps no other area of the cruise ship experience has changed in the last few years as dramatically as specialty dining on Royal Caribbean ships. These additional cost options offer guests additional dining choices to consider, and the array of choices between both ships is impressive. Anthem of the Seas boasts quite a number of specialty restaurants that stand out. Jamie's Italian, Izumi, Chops Grille and Wonderland top the list of popular places guests enjoy on Anthem. We also like the easy grab-and-go nature of Johnny Rockets, which is a la carte instead of a more formal sit down experience on Harmony. Harmony of the Seas is equal to the task when it comes to specialty dining. One big difference on Harmony of the Seas, compared to her Oasis class sisters, is the inclusion of Jamie's Italian. Harmony also boasts its own version of Wonderland, which is significantly larger and encompasses two decks. Even Izumi on Harmony of the Seas is larger, with an exclusive hibachi dining area. You will also find the ever-popular Sabor Taqueria & Tequila Bar on Harmony of the Seas, which heavily sways our vote. Given the fact Harmony matches and exceeds Anthem's specialty dining offerings (and Anthem lacks a Sabor), we have to give Harmony of the Seas the edge once again. Of course, complimentary dining is at the heart of any cruise experience and both ships have a lot of great choices. In comparing the complimentary options, this is a war of attrition, where each ship offers very similar options. Both ships have a Cafe Promenade, Sorrentos, Solarium Bistro, Windjammer, Park Cafe/Cafe @ Two70, Dog House and room service. The key differences here are in the details. First and foremost, Anthem of the Seas is handicapped by the fact it has recently undergone a change from Dynamic Dining back to traditional dining, although it still retains smaller dining rooms in lieu of a larger main dining room. The hours of operations and size of the Windjammer are superior on Anthem of the Seas, but once again, size proves to be the benefit for Harmony. There is a wider selection of choices at Cafe Promenade on Harmony, and the entire main dining room experience is far superior. For that alone, Harmony of the Seas wins this battle. This could be among the least subjective points to consider between the two ships: where they sail to. Harmony of the Seas only offers cruises to the eastern and western Caribbean throughout the year. Essentially the same six to seven ports, no matter when you choose to sail on her. On the other hand, Anthem of the Seas varies her offerings on the time of year. Depending on the season, she offers cruises to the Bahamas, Caribbean, Bermuda, New England and Canada. In addition, Anthem of the Seas is capable of visiting CocoCay, whereas Harmony of the Seas is not. Given the options between the two ships, this is a slam-dunk for Anthem of the Seas. The pool deck experience is arguably one of the most important because it seems this is where guests will spend the most time aggregately during their cruise. After all, when booking a cruise, isn't everyone envisioning sitting by the pool on a deck chair with a drink in hand? Harmony of the Seas has a number of smaller pools, which helps with crowds, and its Splashaway Bay option for kids is the best kids pool area we have seen yet. However, Harmony of the Seas lacks a pool in the Solarium (it has hot tubs and a mister instead), which has bothered many adults who enjoyed having a pool of their own. Meanwhile, Anthem of the Seas not only has a pool in the Solarium, but an additional indoor pool that is perfect for any kind of weather. Combined with the main outdoor pool, pool days on Anthem are quite lovely. Admittedly, the "wave pool" on Anthem of the Seas for kids is less than stellar, so the kids might be better off in the regular pool. Nonetheless, Anthem of the Seas wins the contest of aquatic adventure. Both ships offer the most activities and programming for kids that we have seen across any Royal Caribbean ship. In general, Royal Caribbean has been consistently increasing the amount of space and variety of programming for kids on its ships, and your children will have a blast on either. Adventure Ocean is Royal Caribbean's supervised child program, and both ships have a large dedicated space onboard for kids ranging in ages from 6 months through 17 years old. Harmony of the Seas does have a larger footprint for its Adventure Ocean program, but the quality of offerings on both ships is nearly identical. Harmony of the Seas does have a few dedicated spaces that Anthem does not, such as the art and science labs. There is a definite advantage for older kids (tweens and teens) on Anthem of the Seas because of SeaPlex. SeaPlex offers so much for this age group, that it is undeniably fun for them and because it is indoors, there is rarely any excuse to miss out on it. Bumper cars, Xbox gaming, ping pong, roller skating, dancing, circus school and more are part of the SeaPlex offerings. I am not certain how much Royal Caribbean was targeting teens when they developed the SeaPlex, but it is a homerun with these adolescents. Of course, Harmony of the Seas has water slides and the Ultimate Abyss slide, which provides plenty of thrills for teens. There is also the zip line, mini golf course and the rest of the sports deck. You are just as likely to find plenty of teens hanging out here, as anywhere else. As we mentioned earlier, Splashway Bay is far superior a kids pool area than Anthem's H2O water zone. The nursery facility on both ships is excellent and quite large. Parents of children under three years old will do well with either option. In the end, we might give a slight edge to Anthem of the Seas for older children and Harmony of the Seas for younger children, but the differences are too minute to pick a clear winner. When comparing these ships, they represent the two newest cruise ships in the United States cruise market and also come with a premium price tag because of that distinction. While rates will vary from sailing to sailing and month to month, you can expect to pay more for either ship compared to other ships in the fleet. These ships offer the best that Royal Caribbean has to offer, and it comes with the price tag to match. Even with their premium price tags, both ships offer guests a lot to see, do and eat onboard. Royal Caribbean designed these ships to be destinations in and of themselves, and that means a lot of return on the money paid to cruise on them. Until further notice, we declare the value proposition for either ship a tie. Picking a winner was a lot like picking a favorite child: it depends on the day, but we are giving a slight edge to Harmony of the Seas. It is the newest, shiniest and down right most enjoyable ship we have cruised on to date. In most cases, Harmony of the Seas matches what Anthem of the Seas offers and gives back even more. Harmony of the Seas also benefited greatly from the fact Royal Caribbean added a number of Quantum class features to the ship, such as a Bionic Bar, stateroom design and upgraded technology. If this were a comparison between Oasis or Allure of the Seas and Anthem of the Seas, Anthem of the Seas might have done considerably better. Once again, it is worth noting that we really like Anthem of the Seas. Her entertainment is quite impressive and there is nothing like Two70. Moreover, North Star, Ripcord and the entire SeaPlex is tons of fun, especially if you have older kids with you. However, we are here to declare a winner and the "face that runs the place", the stylin', profilin', limousine riding to the port and wheelin' n' dealin' cruise ship is Harmony of the Seas! In the spirit of fairness, we also posed this question to the public, with a twitter poll and Harmony of the Seas also seems to win the popular vote. In short, there is a lot happening onboard Royal Caribbean's Harmony of the Seas, and that means plenty to see and do during your cruise vacation. For someone going on Harmony of the Seas for the first time, here are five top tips for enjoying what is sure to be a fantastic time aboard. 1. Do not miss Columbus, the Musical! Royal Caribbean packed Harmony of the Seas with lots of terrific entertainment, but the one show we cannot get enough of is Columbus, The Musical!. This original Royal Caribbean production is a fun musical that takes inspirations from hit Broadway shows, such as “Spamalot” and “Something Rotten." Marvin Columbus is the very, very, very, very, very distant relative of Christopher and spent his entire life ‘neath Chris’ shadow. Marvin’s disappointed nobleman father, sends him on a voyage to find his destiny. The story is fun, the cast energetic and the music perfect to sing along with. Columbus is at the very top of our list of favorite shows we have seen onboard any Royal Caribbean ship. Without a doubt, many guests going on Harmony of the Seas have their eyes set on trying the world's tallest slide at sea, the Ultimate Abyss. With that kind of anticipation, one should also expect lines to form regularly for this epic slide. The key to avoiding those lines, is to to get a ride in as soon as you can. Ultimate Abyss is usually open on embarkation day, and since many guests getting onboard are trying to figure out where everything is, those first few hours onboard are the perfect time. Looking at a recent Cruise Compass from Harmony of the Seas' first 7-night cruise out of Port Everglades, Ultimate Abyss is open from 11:30am to 3:30pm on embarkation day. If you want to try something different, challenging and extremely fun, the Escape the Rubicon puzzle break experience is perfect for you. Escape the Rubicon is a timed game, where guests try to solve a series of clues and puzzles hidden in a room that unlock the secret to "escaping" that room. Not only is this experience unlike anything on other cruise ships, it is super fun. In fact, Escape the Rubicon was the most fun we had while onboard Harmony of the Seas, and that is why it is a must-do. There is lots of great food on the Sabor Taqueria & Tequila Bar menu, but if you eat just one thing at Sabor, make sure it is the guacamole. Ever since the first Sabor debuted on a Royal Caribbean ship, we have become disciples of the Guacamole faith, preaching to others the virtues of this fantastic dish. Since Sabor restaurants on Oasis class ships are priced a la carte, one might not order the table-side crafted green treat, but that would be a mistake. Whether you stop in for just the guac and chips or a full meal, you must try the guacamole while onboard Harmony of the Seas. Your taste buds will thank you. Regardless of if you want to take a selfie or just an epic photo of the ocean around you, make plans to go up to the bridge wings during your cruise. The bridge wings are observational platforms that jet out from the side of the ship, and offer terrific views of the area around you. The port bridge wing even features a see-through glass floor that you can stand on to add some panache to your photo. Sunset, sunrise, sailaways and any other time are great for taking photos, and your album will not be complete without a few shots from the bridge wing. We just could not resist including this tip, because after reading all about these fun opportunities on Harmony of the Seas, you might want to book a cruise on her, and that is why you must do as soon as possible. With cruise ship pricing in general, the best prices are found the earlier one books. Sure, there are sales and promotions throughout the year that can change the price, but generally speaking, the lowest fares are attained when guests book their cruise months and years in advance. As soon as you know which sailing you want to reserve, be sure to book it and lock in your price. It is still the best tip for getting the lowest fare on Harmony of the Seas, or any Royal Caribbean cruise. Royal Caribbean's Harmony of the Seas has a lot to offer, including a number of staterooms. Today, we will look at the category D6 Superior Ocean View Stateroom with Balcony, which will take you through the cabin to provide an idea of what to expect if you book this category stateroom. On Harmony of the Seas, we reviewed stateroom 10662, which is located on Deck 10 aft, although it is very close to the aft elevators. The room was very convenient to be so close to the elevator bank. Entry to the room is by RFID scanner, which is above the door handle. Like all staterooms on Harmony of the Seas, the light controls require a SeaPass card to be inserted into a slot near the entrance. Staterooms on Harmony of the Seas look more like staterooms on Quantum class ships than other previous Oasis class ships. Plenty of storage space and a great aesthetic. A D6 stateroom features a full bathroom, including a stand up shower. The room also has a rather large sofa to sit on during the day. Arguably the best feature of this stateroom is the balcony, which provides a private space to enjoy the view of port or the ocean. The balcony is 53 square feet in size, with the stateroom measuring 182 square feet.